Did you know that by some reports conventional chocolate contains more pesticides than any other food product? We strongly believe that the multitudes of pesticides, herbicides, synthetic fetilisers and fungicides commonly found in food negatively impact health. There are many studies to back this up, but we think it's just common sense. If you ate lots of bug poison, would it be good for you? The truth is that when plants are treated - well, nurtured - with nutrient rich soil, quality seeds and proper care, they build natural defences that make pesticides and other "icides" unnecessary. 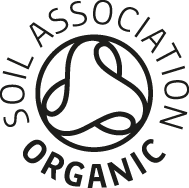 All Rawr chocolate is 100% organically certified by the Soil Association. Organic faming encourages fertile, nutrient rich soils rather than the use of chemical fertilisers, e.g. using clover to fix nitrogen. Organic farmers encourage wildlife as a means of controlling pests and disease. The use of pesticides is severely restricted. In the UK, plant, insect and bird life is around 50% greater on organic farms than non-organic. Genetically modified (GM) ingredients are banned. Organic farming produces less greenhouse gases. Organic means much higher standards of animal welfare. This doesn't directly apply to our vegan chocolate, but it's important. Organic food is widely believed to be more nutritious than non-organic, and tastier too. This means there are much less chemicals in your food - and consequently your body - a much more sustainable way of farming the earth. We're proud to be organic.